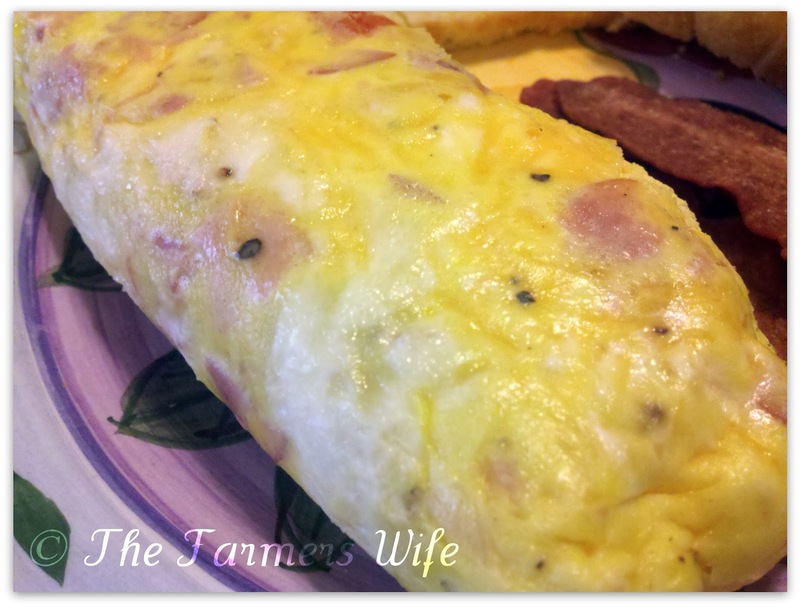 The Farmers Wife: Omelet in a bag?!?! This is my adaptation of this recipe, found all over blog world! Ok, so I'm sure by now all of you have seen the latest egg craze that is all over the internet, Omelet in a bag. Yeah I know, I was shocked by it too, it goes against everything I know to boil a ziploc bag. But I figured hey, if everyone else is able to make these successfully than I should be able to as well right? Well let me say, they were pretty good! Honestly, they are a little different taste wise from a normal omelet, probably because they're not loaded up with grease and butter to keep them from sticking to the pan. And don't get me wrong, I'm all for eating healthy and cutting out the sticky mess of making an omelet in a pan. I'm just warning you, they do taste slightly different. But on the flip side, they were SO fluffy (ok now I'm channeling the movie Despicable Me "IT'S SO FLUFFY!!! haha! ), and so super easy with very little prep work or clean up. Which you all know I love! I really highly recommend giving these a try, they're easy to whip up, and what's nice is you can make a few at a time and still everyone can get exactly what they want in their omelet, so you get breakfast on the table faster! These really were pretty simple and fast to whip up, overall I enjoyed it. I wish I had mixed mine a little more and added more cheese but that's totally just my personal preference. These were a pretty lo-cal way to start our morning, and really good with a piece of English Toasting Bread with Orange Marmalade. Yum! 4 stars. I've never heard of omelet in a bag. I will have to try this. Interesting what comes up everyday.